Housed in a cosy shop space on a quiet Barcelona side street, Aixo is one of this vibrant city's many hidden gems. 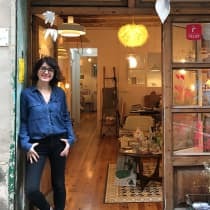 Belén García founded Aixo after becoming a mother, wanting to create a place where she could share her love of interiors with her local community. Filled with a mixture of unique items, Scandinavian brands and vintage finds, it's a treasure trove of curios for the intrepid shopper. "When customers visit our shop I always listen to them carefully and try to give them personalised recommendations that will make their home even more lovely than it already is. "